We have two more long-time young performers leaving the Playhouse community. And...they are leaving together. Recently engaged, Sarah Bunch and Jesse Miller will be departing together in the fall to attend Eastern New Mexico University. Sarah has appeared in Hobbs High School's production of "Bye Bye Birdie" and as Mrs. Pringle in NMJC's "Mr. Flannery's Ocean", and made her Playhouse debut as Gertrude McFuzz in "Seussical". This season she appeared as Sally Brown in "You're a Good Man, Charlie Brown", followed by appearances in "Beauty and the Beast" and "Willy Wonka". Sarah was also a 2010 recipient of the Playhouse's Carl Busch Scholarship. Jesse is no stranger to the stage, appearing in NMJC's "Mr. Flannery's Ocean" and as Andrew in "Beyond Therapy", as well as appearances at Hobbs High in "Bye Bye Birdie", "Rumors", and as Nathan Detroit in "Guys and Dolls". At the Playhouse, Jesse had roles in "Christmas at Home", as Horton the Elephant in "Seussical", George Deever in "All My Sons", and most recently as the Beast in "Beauty and the Beast" and the Candyman in "Willy Wonka". He was Assistant Director for "Mr. Flannery's Ocean" at NMJC and Properties Master for "Willy Wonka" at the Playhouse. Jesse was awarded the Monologue Performance Scholarship from Eastern New Mexico University and the Hobbs High School Drama Club Scholarship. Sarah...Jesse...we wish you the best as you head to college and start your life together. Best wishes to both of you! Briana Schneider will be departing Hobbs this fall, joining the Sooners of the University of Oklahoma. Briana has been involved with the Community Players of Hobbs for over 12 years...yes, 12 years, meaning her stage debut at the Playhouse was at the young age of 6! Her first role was Sarah Cratchett in the classic Christmas show "A Christmas Carol". Prior to that, she'd taken the stage as Puck in a 5th grade production of "A Midsummer Night's Dream". She made her musical debut in junior high, returning to the playhouse for "Bah Humbug", followed by roles in "Monsters in the Closet", "Grease", "A Company of Wayward Saints", "Annie", "Christmas at Home", "Seussical", and in her final Playhouse performance in "Willy Wonka". Briana has also taken the stage at Hobbs High School, appearing in "Soap Opera", "Bye Bye Birdie", and "The Weather Show" while in elementary school, as well as appearances at New Mexico Junior College in "Beyond Therapy", "The Lion in Winter", and "Murder Room". In addition to her numerous acting roles, Briana has filled numerious crew roles in shows both at the Playhouse and Hobbs High. She assisted as a member of the deck crew for "I Love You, You're Perfect, Now Change". 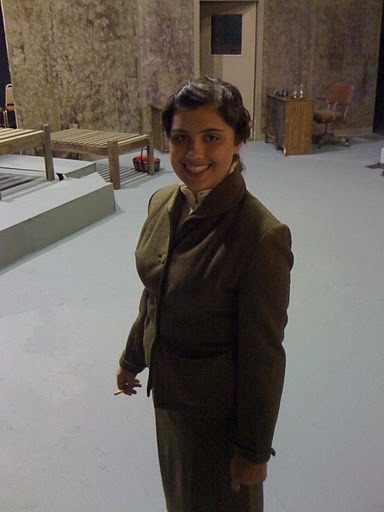 She was the Stage Manager for "Rabbit Hole" and "All My Sons" at the Playhouse, "Guys and Dolls" at Hobbs High, and "The Zoo Story" at the 2011 AACTFest in Artesia, NM, helping the Playhouse entry take Alternate. 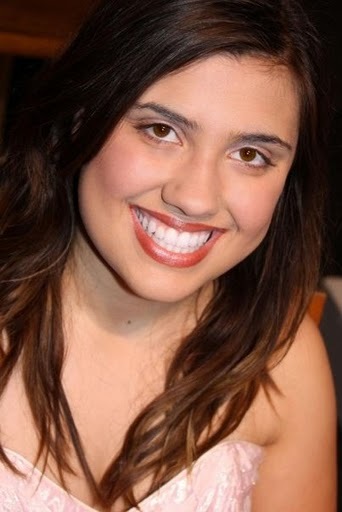 An accomplished vocalist, Briana won numerious honors for her participation in Choir at Hobbs High, and was a member of "Accidental Harmony", a local music group with several other Playhouse "regulars". Please join us in wishing Briana a fond farewell. We'll miss you, Briana! "Home Front", the drama by James Duff, finds the Collier family and their son, Jeremy Collier, dealing with his return from the Vietnam War and the significant problems that adjustment to post-war life entail. "Home Front" is directed by Bill Raabe, with assistant director Erin Miller-Gibbs. 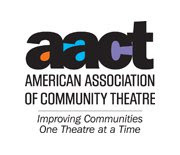 The show features Nathan Gibbs as Jeremy Collier, Tisha Thompson as Maurine Collier, Robert Schumacher as Bob Collier, and Veronikka Sylvas as Karen Collier. Show dates are September 9th, 10th (8 PM), 11th (2 PM matinee), 16th, 17th (8 PM). WILLY WONKA Jr.: Tickets are on sale now at the Hobbs Community Playhouse from 1-6 p.m. Monday-Saturday. The show starts Thursday, July 21. This is the annual summer youth camp theater production directed by Sandy Goad and Ronnie Gray. The show is based on the movie musical so there will be Oompa Loompas galore! Don't miss out on this production. Go by the Playhouse, 1700 N. Grimes, today and get your tickets. Show dates are July 21-23 (Thur-Sat) at 7:30 p.m. and July 24 (Sun) at 2 p.m. Can you say "Chocolate!" BOARD MEETING: Sadly, Micki Bain is stepping down from the board of directors because she is moving to Texas in a few short days. She will be greatly missed and has been a wonderful volunteer, board member and friend to many. As treasurer, she has done a great job and takes care of a ton of Playhouse business behind the scenes that few every know about. I have spoken with Kerri Gray, who works at Johnson Miller, is an accountant and soon to be a CPA (if I have my facts correct). She has agreed to serve on the board. Kerri has performed in several productions at the Playhouse and will help us non-accounting folks keep track of the bills and count stuff. Per the bylaws, the board will be voting on her to fill the remainder of Micki's term at a meeting at 6:30 p.m. on July 21st at the Playhouse. Find us on Facebook, MySpace, Twitter, YouTube and Google Plus. 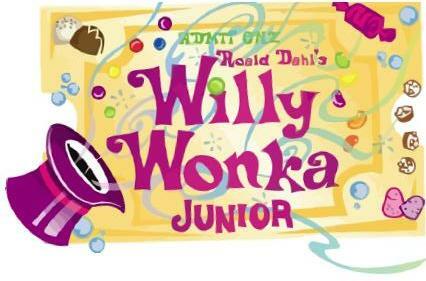 WILLY WONKA Jr. tickets are on sale now at the Hobbs Community Playhouse from 1-6 p.m. Monday-Saturday. This is the annual summer youth camp theater production directed by Sandy Goad and Ronnie Gray. The show is based on the movie musical so there will be Oompa Loompas galore! Don't miss out on this production. Go by the Playhouse, 1700 N. Grimes, today and get your tickets. Show dates are July 21-23 (Thursday-Saturday) at 7:30 p.m. and July 24 (Sunday) at 2 p.m.
"Home Front" auditions will be this Sunday and Monday at 6 p.m. at the Western Heritage Museum on the New Mexico Junior College campus. 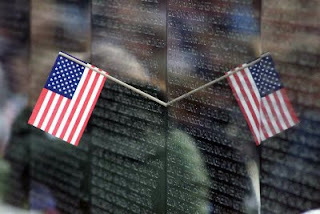 The drama, about a Texas family dealing with a son returning from the Vietnam War, calls for two men, one age 45-50 and the other between 17-23, and two women, one age 45-50 and the other between 17-23. The show is being directed by Bill Raabe with assistant director Erin Miller-Gibbs. Show dates are Sept. 9th, 10th, 11th (matinee), 16th, and 17th. 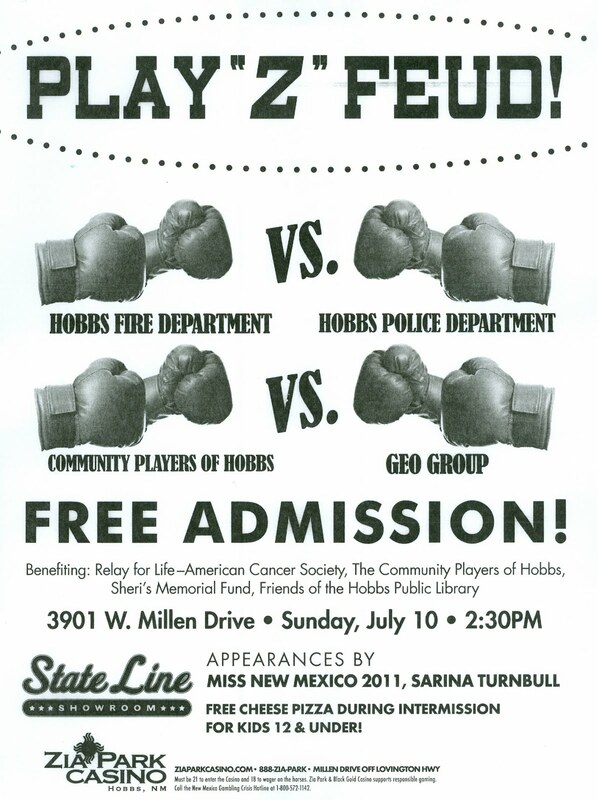 Come out and support your Community Players of Hobbs family as we play "Z" Feud at Zia Park Casino! We will be playing this Family Feud-style game against the Geo Group. 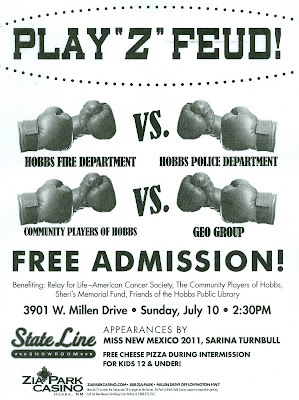 The game starts at 2:30, Sunday, July 10 at the Casino. Admission is FREE so come support your family!!! !